I broke out this old favorite retired stamp set! She called me today and said she wanted to use it for her Christmas cards this year and knew she wanted to do green with gold embossing. Otherwise, she was stumped after playing with it for a while. Well, I just couldn't contain myself - I cleared off my worktable and pulled this stamp set - Solemn Stillness out of my Craig's List pile - yes, it's going on the auction block soon, so if you want it, contact me! 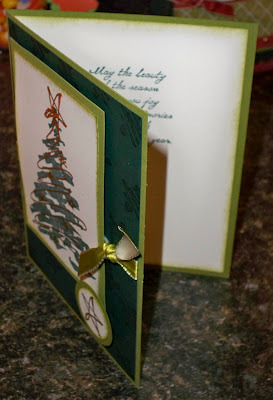 With Kimberly on the phone, I pulled out Old Olive cardstock for the card base and layered it with Handsome Hunter which is stamped with the sketchy star image in Handsome Hunter ink. 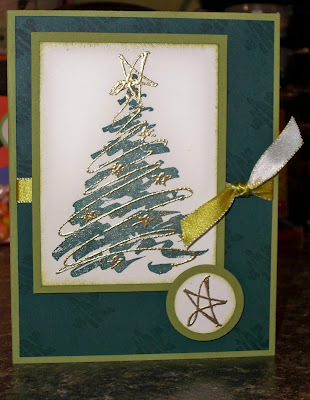 The main Christmas tree image was stamped on Very Vanilla cardstock with Handsome Hunter ink and then I used the garland stamp and the large open star to decorate the tree. It was inked in Gold Encore ink and embossed with Gold Embossing Powder. Lastly, I lightly sponged the edges of this layer with Old Olive ink. The Christmas tree image is then layered onto Old Olive cardstock and mounted on dimensionals so it pops up above that yummy, luscious Kiwi Kiss Satin ribbon! one more time with Gold Encore on Very Vanilla cardstock and embossed it with Gold Embossing Powder. This was punched out with the 1" Circle punch, sponged with Old Olive ink and mounted on some Old Olive cardstock punched with the 1 1/4" Circle punch. this was popped up on 2 dimensionals stacked so it rests above the main layer. So, whaddya think? Do you like it? Well, Kimberly LOVED it and I know she got a kick out of hearing me create! I was very excited that it all came together in less than 15 minutes. Too cool! So, about that stamp set again - I've got a whole list of retired sets that I've been either too busy or too lazy to put on Craigs list, but it's happening soon, so if you want the list or want just this set, contact me - I have a lot of stamps that need a loving new home! What an awesome card!!! I love it!! I have that set too but I don't think I can give it up quite yet!! !